You know the expression, “they just don’t make these like they used to?” 1999’s “The Mummy” is a prime example of a summer blockbuster that is just plain fun, with plenty of thrills and action to keep the audience at the edge of their seats and cheering out loud for the protagonists. In spirit for the upcoming reboot starring Tom Cruise coming out this week, it’s a good time to look back at a moment in which thrills were high and the need to think was low. 1999’s “The Mummy” had an excellent blend of the lighthearted pulpy action of “Indiana Jones,” while retaining the horror elements from the 1931 classic. Whenever the swashbuckling action boomed onto the screen, you can’t help but cheer along with our heroes, escaping each impossible scenario with finesse and bravado. The film’s villain Imhotep, played fantastically by Arnold Vosloo, is horrifying to look at throughout the film as he goes from walking corpse to a fully formed monster. The film has similar plot elements from the original while adding more of an epic scale to it and an emphasis on action. 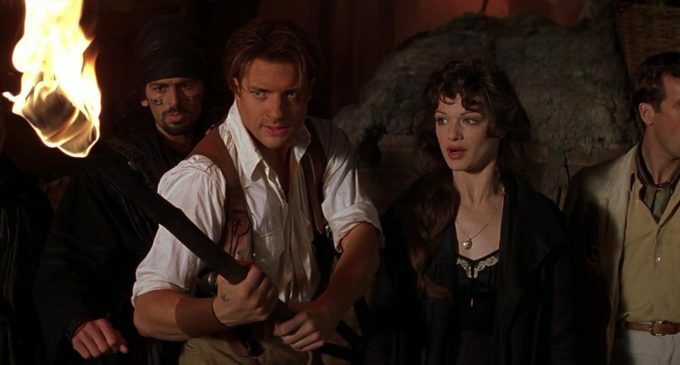 It revolves around Brendan Fraser’s character, the heroic soldier-turned-adventurer Rick O’Connell, along with a meek librarian (Rachel Weitz) who knows how to read ancient Egyptian hieroglyphics and her brother accidentally awakening a cursed Egyptian priest. When awakened, the priest is meant to destroy the world and everything living on it. It’s up to O’Connell and the gang to stop him before it’s too late. Through and through, this is probably a movie most of us grew up watching. With Imhotep’s decaying body scaring the living daylights out of us whenever he popped up on screen, this movie has certainly held up over time. It doesn’t have the thought-out details and polish that the first three “Indiana Jones” movies have, but the film still has crowd-pleasing set-pieces and action scenes that we’ll enjoy long after Universal comes with yet another reboot of the series again in the near future. Featured Image: Brendan Fraser and Rachel Weisz, in center, were among the many stars of 1999’s “The Mummy.” Universal Pictures.